My mom found this definition of grief and posted it to Facebook this week. And just like that - another trigger. This time, it's a good one because it allows me to spill it all. The grief. The journey. The good, the bad, and the downright sucky. I loved these words because grief is so damn confusing. We all have a notion. We will be sad - maybe for a long time. We will question - maybe even longer than any other stage. We will get angry - and maybe stick there for a bit. When my dad died in 2002, the news and our new life often knocked me to my knees. Everything was different. 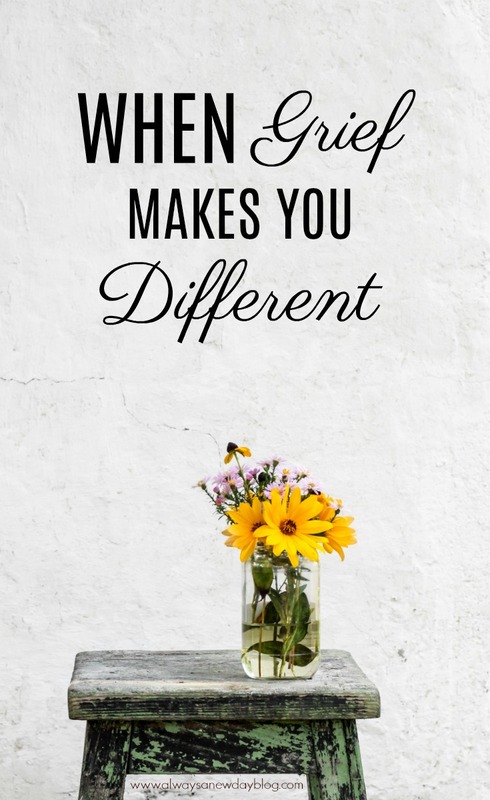 In fact, a friend told me I was so different than before, and at first, I felt bad. I didn't mean to be different. I fought really hard to tiptoe through each grief stage. I stunk at most steps, but after years of help, I was getting somewhere. I realized I WAS different. This new me was stuck but treading on. When my brother died 17 months ago, I remember sitting in my closet with a glass of wine (because...grief) thinking "here we go again. Guess I am about to be different all over again." And just because I lost my dad didn't mean I felt confident in loss this time around. In fact, I had to absorb this one in a whole other way (still absorbing, to be honest), and I am sure I am stinking this one up something fierce, too. Some may say I haven't adjusted well or I talk about it too much. Some may say I need to accept it and move on, but here's the truth - no one knows when or if ever I will do either one. I am not saying I will wallow or cry or be angry forever (I fight hard to make it through these times in a healthy manner), but I will have days. We all will. Grief will never be completed. We have to endure life without two people - that's hard to grasp even 15 years and/or 17 months later. All of us left in my family don't have a task in front of us to complete. There's not a check mark next to "get over deaths of loved ones" on our to-do list. I am writing these words because we seek patience and love and support. We also still appreciate prayers. Not just for living with the loss but as we navigate life AFTER loss. We ARE different. If you have experienced any loss or change in your life that left you reeling, you are different, too. I write that because it's okay to be different. It's okay to struggle with absorption. And it's okay to have hard days. You may not know loss, but I bet you know change. I bet you know hardship. It's just that - we are always seeking new ways to better ourselves. The words my mom posted are the truest words I've read about grief. Though they were another trigger, I am happy it triggered words that give grief a face, too. So much TRUTH! Just beautiful, friend. Change and grief do make us different, and because of God's grace, we always, always come out better on the other side. Love you! You've got that right! God's grace saves me daily! Thank for your transparency! This was really good! Truthfully, I can't forget the moment when my best friend was in hospital, fighting with her death, she saw me and some tears came out from her eyes. I can understand your situation and pray that you get courage to bear the loss. My prayers to you as well. Thank you so much for reading! This is so true my friend! It does change us, there's a part of our lives that will never be the same. We learn to cope with the pain but the hurt of their absence is forever present in our lives. There are days of ultimate strength and days we are oh so fragile, but God carry us thru it all. He sure will. He carries me all of my days. Thank you for reading!